From the PEI Freeze Your Gizzard Run (10K and half marathon), more photos by jypsy in Alex's Running and Race Page. And another video on Jason McElwain from the Diva's 3 hanky basketball story. Thanks to jypsy for heads up re Autistic teen scores major points in basketball game and two videos here [search "J-Mac"]. See also: Autistic team manager wows the crowd and Autistic high schooler scores 20 in debut. These are the extreme points we touched in 2003, the others mainly along a center line between St. Jacobs (top) and Galt (bottom right): 29 km, as the crow flies. 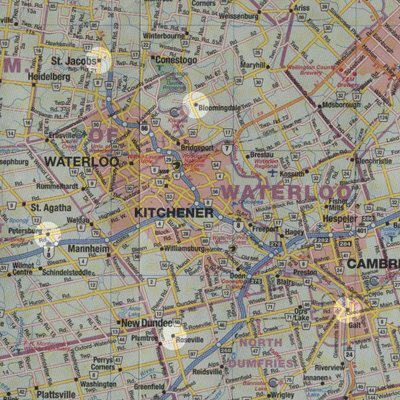 I think the next step is to connect-the-dots in an elliptical route around the region, likely including the Grand River Trail (which should be completed by now). 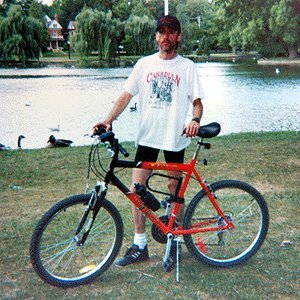 A new bike (2002) and the beginning of my renewed interest in cycling. The comeback: my cycling partner (he's behind the camera) had previously survived 4 heart attacks, a quadruple bypass and would go on to lose over 50 pounds of extra weight (not all due to cycling); a very ordinary guy (and a dear friend) who simply did it. 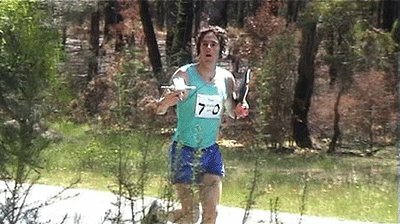 Tony Langdon on his way to an "individual bronze medal in the 2003 Region 3 (Asia-Pacific) ARDF (radio orienteering) Championships, 80m (3.5 MHz) event". Thanks to Tony for providing the pic and for explaining the technical stuff in layman's terms. This blog started as a web page that I never got around to finishing - inspired by Alex Bain and Tony Langdon - now jump-started by minna's Training for Life.